lobbyists, bloggers, analysts in the US healthcare industry. Its interesting to see a take on these two words after their new life as part of the HITECH (Health Information Technology for Economic and Clinical Health Act) investment act part of ARRA (American Reinvestment and Recovery Act), a stimulus plan for US recovery. Who gave new life to this words: Department of Health and Human Services in US, who is going to be doling out ~30 billion USD in financial incentives for the adoption of electronic medical records in provider’s care infrastructure as part of the HITECT act, which is part of ARRA. of everyone in the industry. That was quite the sticker shock for getting money from the feds! For example if I am using a car to drive to work, am I having a “Meaningful Use” of the car ? If I look from my perspective, of course yes, the meaningful use is Transportation. If you try to look from an environmentalist perspective, of course I am not a having a “meaningful use” of our planet by polluting it with my car. That’s the way everyone involved in the US industry is looking it from their perspective and having war of words with it. From my friends at Medseek, they looked at it from the users(patient’s) perspective. Anything done in the name of tax payer’s money better be of “meaningful use” to the citizens. how the HITECH investment act follows through to achieve improvements in population health while balancing the competing goals of healthcare providers. is the key focus both in Canada and US. 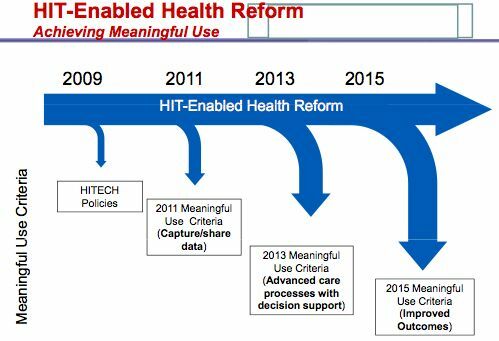 More on “Meaningful Use” later…have a meaningful rest of the week and weekend that follows.